After getting my new Merida Scultura 5000 road bike, it is time to add some accessories to the bike! 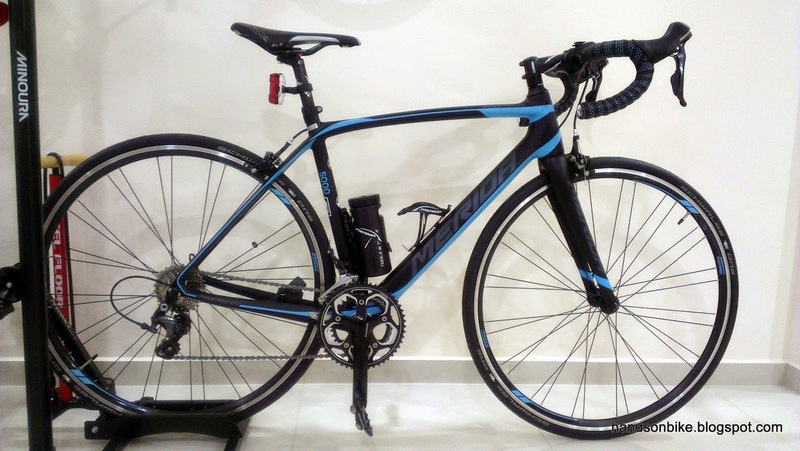 As I want this bike to be a lightweight road bike, it would be best to minimise the amount of additional weight due to tools and accessories. 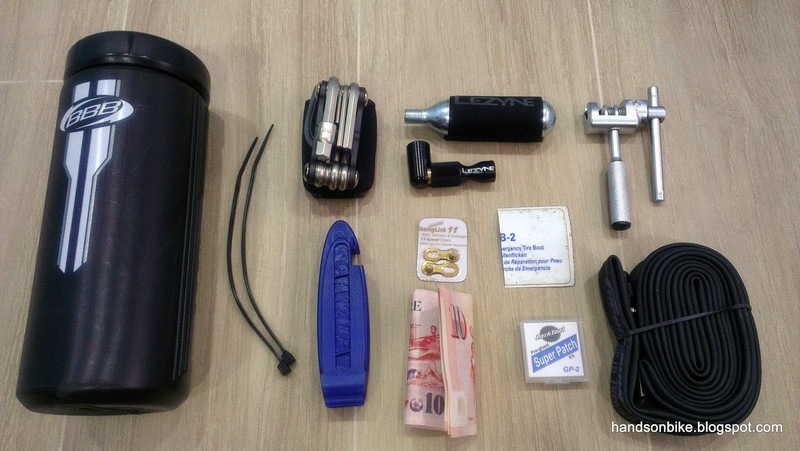 However, some tools are essential, such as a small hand pump, tire levers and a spare tube. There are a few ways to carry tools on a road bike. By far the most common is to use a rear saddle bag, but it can be kind of bulky (even the small ones) and spoils the streamlined look of the road bike. 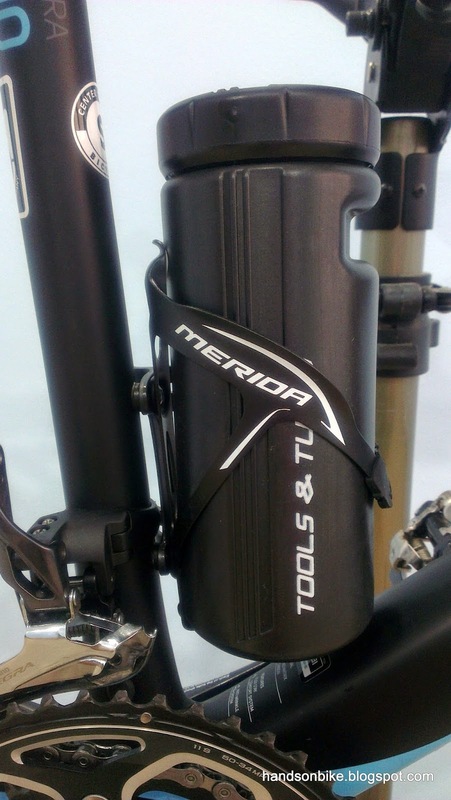 An alternative way is to get a top tube mounted bag which rests on the top tube, just behind the stem. However, I find that I will hit the top tube bag when I move down from the saddle during a stop, so that is out of the question too. Some riders will put spares in the back pockets of the cycling jersey, but I am always afraid that the items will drop out too easily. Finally I decided to use one of the water bottle cages to hold the tools and spares. You can always use an old water bottle to hold the stuff, but I wanted to get a nicer looking tool bottle that can be used to store tools. Although this occupies one of the water bottle cages, leaving only one for the actual water bottle, I feel that this should be enough for most of the rides I do. On longer rides where I will need two water bottles, I will probably put the tool bottle in the backpack. 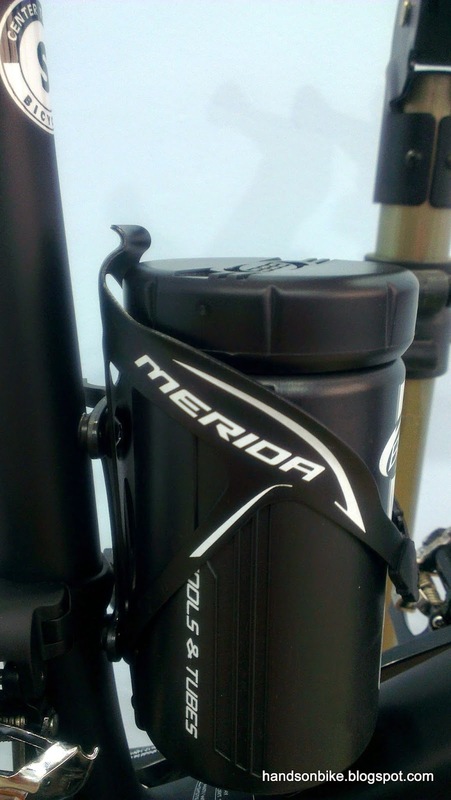 The two water bottle cages on the Merida frame. One will be used for the tool bottle! ...and this is the Small sized tool bottle. What is the difference? Let's find out! They are similar in circumference, and only differ in height. 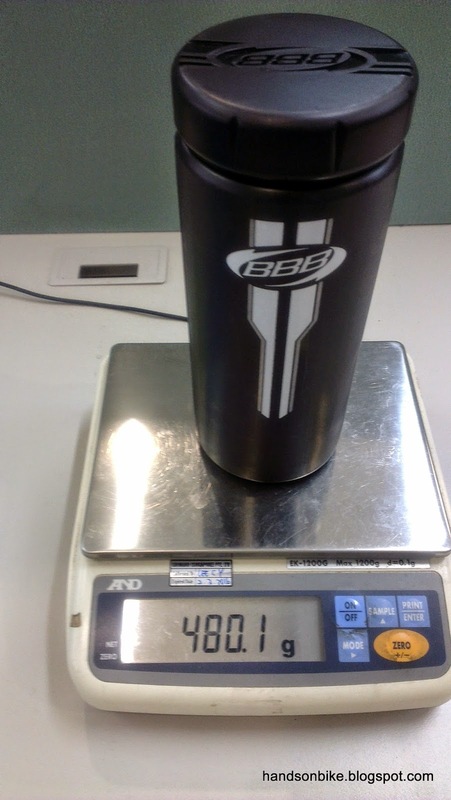 The small tool bottle is about 133mm in height, while the large tool bottle is about 183mm in height. I first tried the small tool bottle, but it does not fit tightly in the bottle cage. 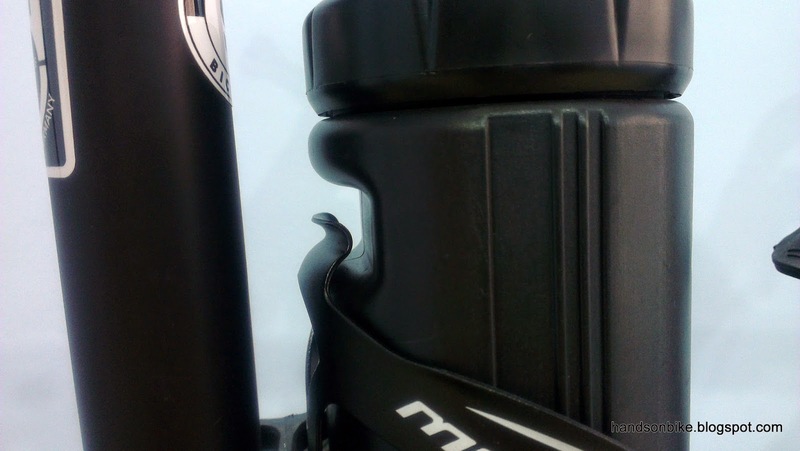 The catch on the bottle cage is higher than the tool bottle, and the bottle's circumference is slightly smaller than the bottle cage. 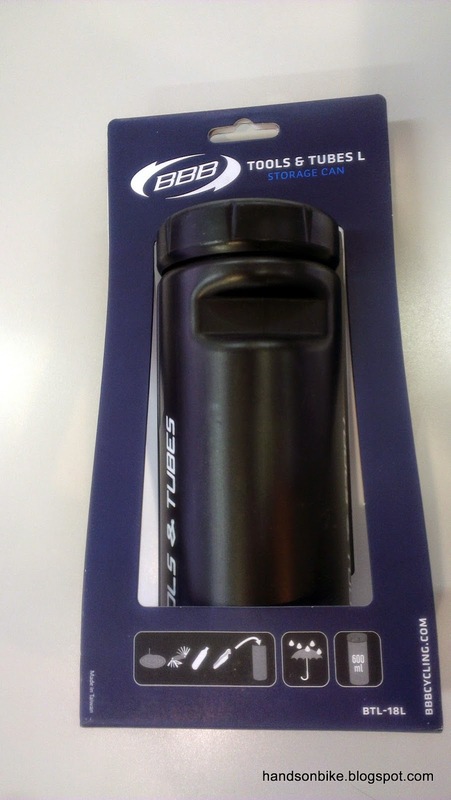 The large tool bottle has a depression at the side which is meant for the catch, however it is unable to fit securely. To get the large tool bottle to fit, I turned the tool bottle around such that the catch on the bottle cage pushes against the flat side of the tool bottle. This creates some interference which fits the tool bottle snugly in the bottle cage. After some trial and error, I found that all my tools can actually fit in the small tool bottle. However, the small tool bottle cannot be securely fitted to the bottle cage, which is why I decided to use the large tool bottle. 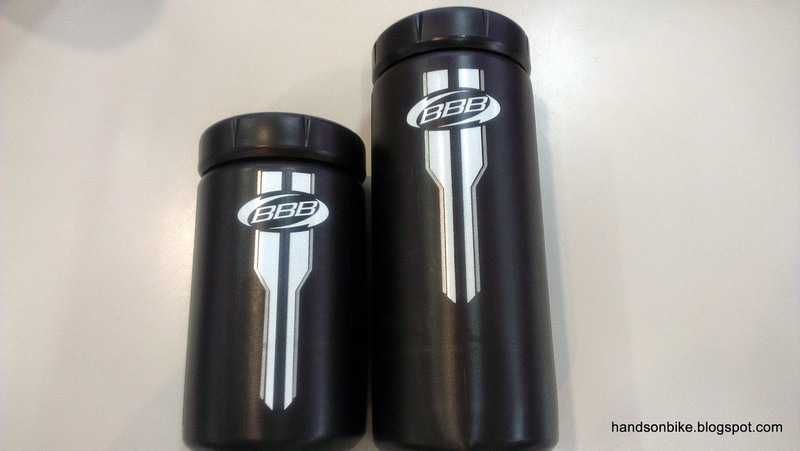 As the tools are unable to fully fill the large tool bottle, they will rattle in the empty space in the large tool bottle. My solution is to fit in 2 pieces of lightweight foam to fill up the space at the bottom of the tool bottle, before putting in the tools. This is kind of silly as the extra space is wasted, but I can't think of a better way for now, apart from stuffing in more tools? 2 x foam blocks are first placed into the large tool bottle. This takes up the extra space in the bottle, and also provides a soft layer to prevent the tools from rattling against the bottom of the tool bottle. The weight of the empty large tool bottle + 2 pieces of foam inside. The large tool bottle with all my selected tools and spares! 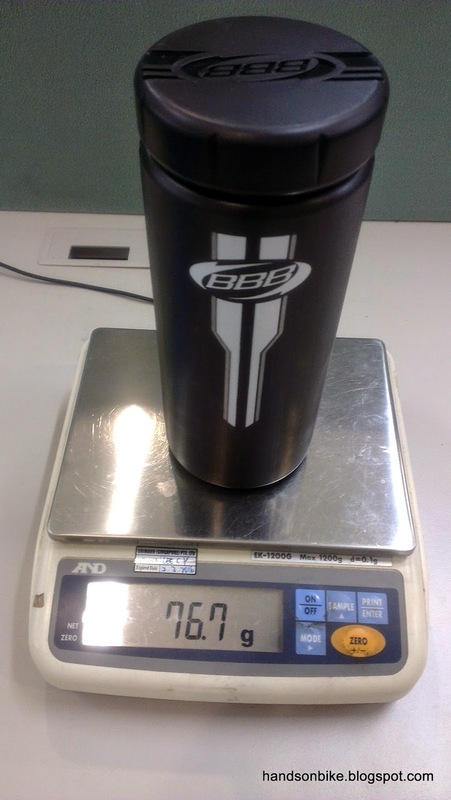 This means that the tools and spares weigh about 400 grams. 1) 2 x cable ties. Weigh next to nothing, but useful for tying up loose stuff or cables if they are broken or loose. A roll of tape will also work. 2) Topeak Mini 9 Multi Tool. Bare minimum of tools to adjust and tighten bolts and screws on the bike. 3) Topeak Universal Chain Tool. Necessary if you ever need to fix a broken chain. 4) 11 speed KMC Missing Link (spare quick release chain links). Quick and easy way to fix a broken chain by removing the damaged link with the chain tool, and installing these Missing Links by hand. 5) Schwalbe Tire Levers. Best tire levers for removing tight tires from the rims. 7) Park Tool Emergency Tire Boot. Used to patch a torn tire if sliced through by sharp road debris. Different from a tube patch. 8) Park Tool Super Patch Kit. 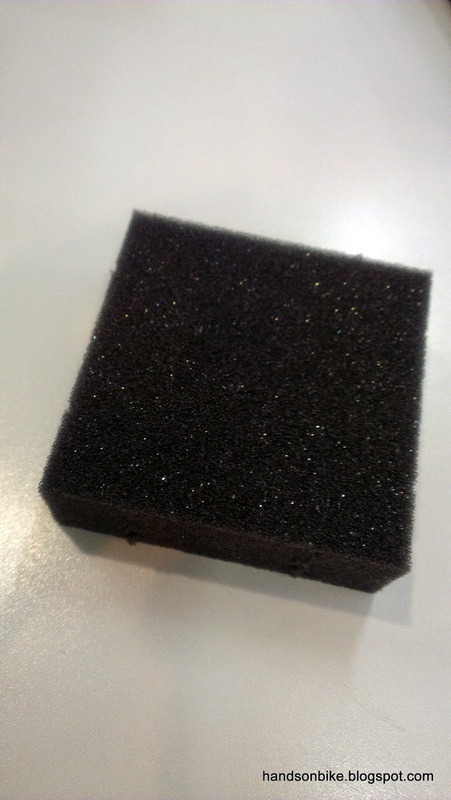 Comes with sandpaper for scuffing the tube and some pre-glued patches for fixing the hole in the tube. Only will be used if the spare tube also gets punctured. 10) Lezyne CO2 Trigger Drive, for quick inflation of a flat tube to the correct high pressure. 11) Lezyne Pressure Drive hand pump (not shown). Just in case the CO2 cartridge fails. That is a pretty long list of spares and tools! Some may be redundant, but it is better to be safe. If I were to trim down the list, I would remove the Lezyne CO2 Trigger drive and depend solely on the hand pump. The emergency tire boot, patch kit, KMC Missing Link and cable ties can also be removed, but they are so lightweight that there is no reason not to carry them. The other tools and spares are absolute essentials for me. 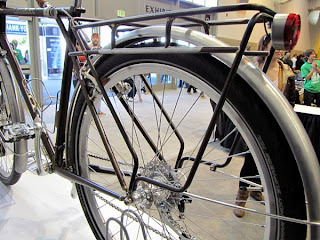 Multi tool, chain tool, tire levers, spare tube and hand pump are the minimum that I would carry on this road bike. So how does everything fit into the tool bottle? 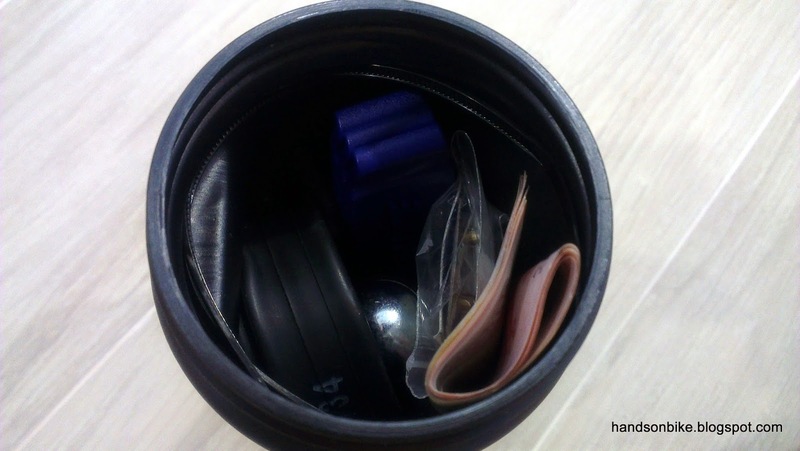 It is important to fit everything snugly so that there is no space for the tools to rattle about in the tool bottle. Managed to squeeze everything into the tool bottle. The multi tool (not shown) will be placed on top since it will be the most frequently accessed. 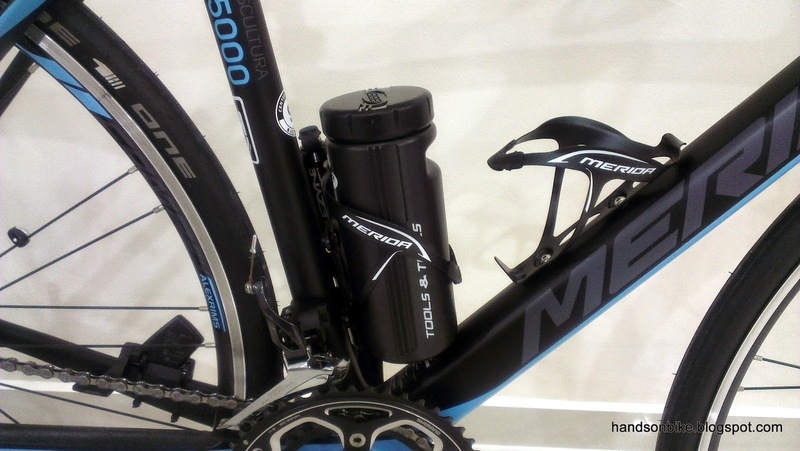 The tool bottle fits nicely into the bottle cage and looks well integrated with the frame. No extra bags hanging around the bike! 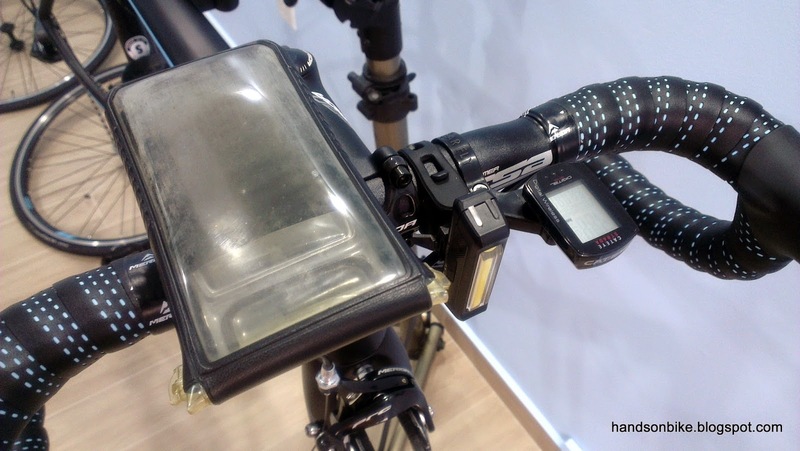 Other than the tools and spares, the other accessories would be the front light, rear light and the cycle computer. For the rear light I am using the Bontrager Flare 3, which was originally mounted on the rear rack of the Dahon Boardwalk. 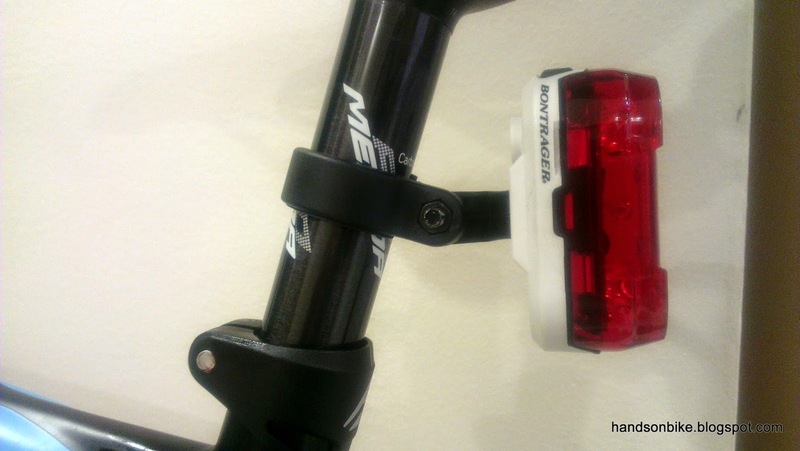 Bontrager Flare 3 rear light mounted on the seat post. 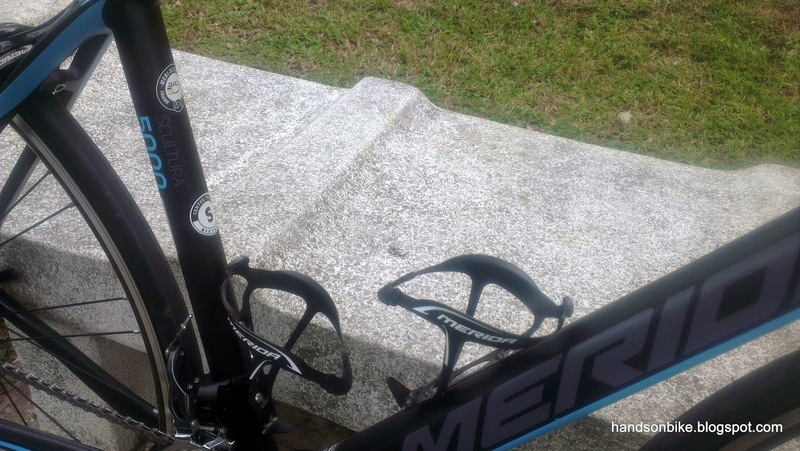 There are a few accessories on the handlebar which I want to use, so it was quite tricky to arrange everything such that they fit on the narrow drop bar, and yet don't interfere with my hands when holding the top of the drop bar. Since there are no bags on the bike to hold my mobile phone when I am riding, I had to mount a Topeak Smartphone DryBag on the drop bar. This bag is rather big and takes up one whole side of the drop bar. This leaves only the other side of the drop bar for the cycle computer and the front light. For the other side of the handlebar, I had to get another of the Bar Fly Bracket for Cateye cycle computers, so that the cycle computer can be moved to the side. This also puts the cycle computer closer to the side so that it is easier for me to reach the cycle computer with my hands. The cycle computer that I am using is the Cateye Strada Digital Wireless. 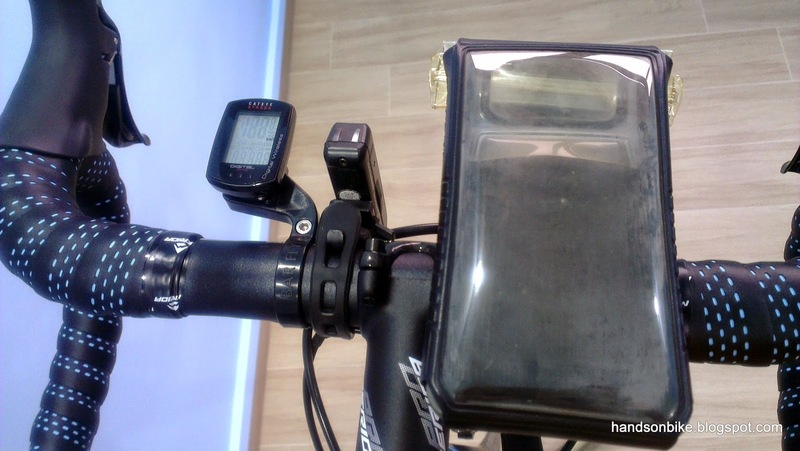 Lastly, the front light that is on this road bike is the slim Moon Comet front light. 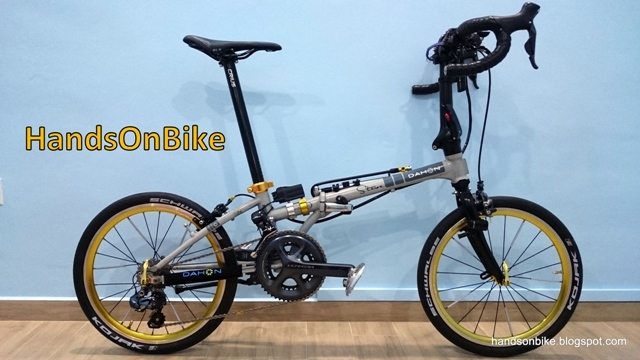 I just took one of the two Moon Comet front lights that are on the Dahon Boardwalk and installed it on this bike. Managed to fit everything nicely on the drop bar! The Topeak bag is large but necessary for holding the phone. With the large Topeak bag removed, the handlebar looks much neater. After getting some new bottle cages, I can now use the small tool bottle on the bike as they fit nicely into the new bottle cages. Click on the link below to find out. 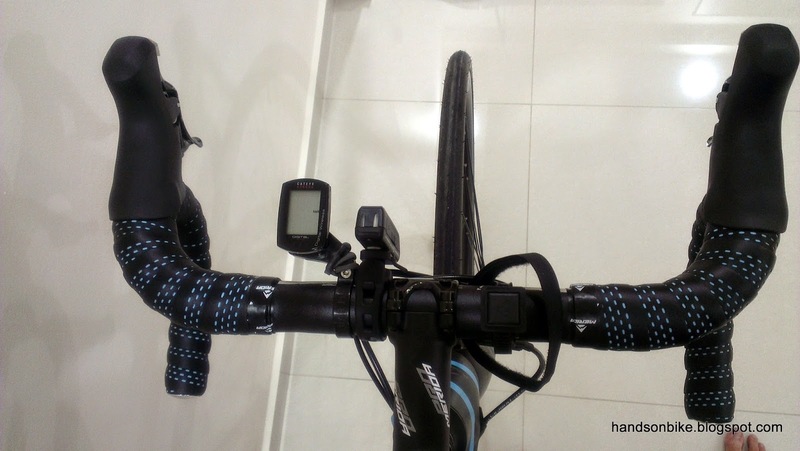 Hello, where did you purchase the black with blue stitching bar tape? It looks nice! It came stock with the bike, so I am not sure where to get it. 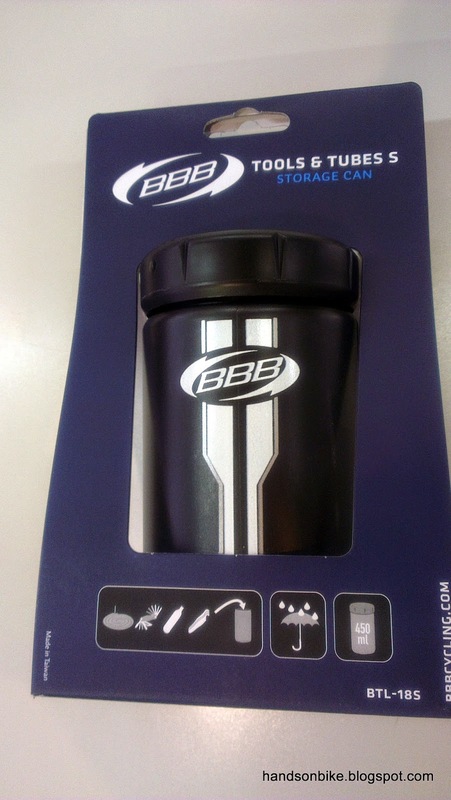 May I know where you bought your BBB tool bottle from? I'm interested in getting one to increase the amount of emergency maintenance tools that I can carry without a use of a backpack.